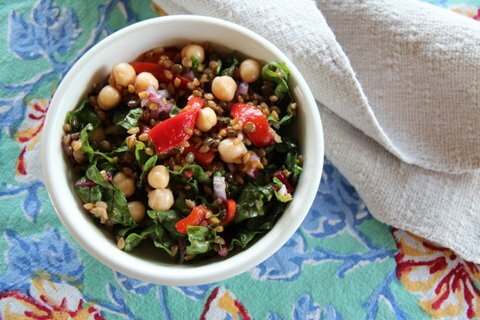 This summer salad recipe celebrates the flavors grains, peppers, and fresh garden chard while adding a protein punch! Perfect for lunch or a dinner side dish. On Stovetop simmer Whole Emmer farro and French Lentils together in 4 cups of water with a dash of salt for 40-50 minutes. Drain excess liquid. Cool. While Emmer and Lentils are cooking roast peppers in oven for 30 minutes until the skins are wrinkled and peppers are charred, turning them twice during roasting. Remove from the oven and cover tightly until they are cool enough to handle. Slice in long thin strips. Chop Swiss chard and onion. Combine all ingredients together. Dress with olive oil, lemon juice, and sea salt and sprinkle with a pinch of fresh ground cumin.